RMR | Institution | What is the RMR? The brotherhoods, maestranzas and other bodies belonging to the cavalry played a significant role in the military and political history of Andalusia as well as that of Spain as a whole. These were created by the Crown to allow local nobility train as riders and use weaponry in order to be able to act immediately when summonsed by the King. While the term "maestranza" was not used until the mid-seventeenth century in Andalusia (a derivation of the word "master or maestro", which was given to anyone involved in teaching the art of la jineta, an Arabo-Andalusian style of horse- riding), the history of the Royal Maestranza of Cavalry dates back to the foundation of the first Confraternity in Ronda in 1573, the last one emerging in Saragossa in 1824. Those of Seville, Granada and Valencia were founded during the 17th Century. In the case of Ronda, Philip II merely sanctioned and encouraged a practice that was already in existence: even prior to the Royal Decree dated 6 September 1572 which founded the Maestranza itself, we can see, for example, that the military body belonging to Ronda's nobility intervened in the war against the Moors in 1569. "The origins of the maestranzas lie in the Royal Decree granted by Philip II"
The origins of the maestranzas lie in the Royal Decree granted by Philip II on 6 September 1572, which urged «the knights and other leading gentlemen within the cities, towns and villages of this Kingdom to found and establish Brotherhoods, Companies or Orders dedicated to a particular Saint, introducing the corresponding By-Laws, conditions and chapters to establish Jousting, Tournament and Lancing Jousting feast days as well as other military activities to be celebrated on designated days». In his Decree, the King implored the knights to prepare for war through the practice of tournaments, lance jousting, shot-put contests, gymnastic rings and, last but not least, bull spearing, which apart from being a popular spectator sport, also formed part of equestrian training. Philip II's Decree was read at the council meeting in Ronda on Tuesday 22 September 1572. The Chief Magistrate and other knights in attendance representing the city following the customary ritual, removed their hats, took the King's letter in their hands, kissed it and placed it on their heads as a sign of reverence. Apart from remembering to notify all those knights who were not present thereof, a decision was made to commence with a clean-up of the public thoroughfare at the Plaza del Pozo bullring, as well as the purchase of a jineta spear and bells so that as many horses as desired could run on feast days. The Brotherhood of the Holy Spirit, what would later become known as the Maestranza, was established in 1573, with statutes passed for the celebration of equestrian feast days «on the day following Whitsun, Saint John's Day, Saint Peter's Day, Shrove Tuesday and Easter as well as every Thursday when the young knights would ride on horseback through the Plaza del Pozo, Our Lady of Grace chosen as the patron Saint». A little time later in 1575, Philip II instructed the Maestranza of Ronda to ensure that the knights did their very best to breed «good horses for the guard and defence of the Kingdom», passing laws on the breeding and preservation of horse breeds in Ronda, which they dedicated themselves to from the very outset. The Maestranza at this time was «an educational institution, an authentic school providing military instruction, whose catechism was encapsulated in the graceful art of horsemanship and spear fencing, which were proudly displayed during public feast days occurring on designated days, whose exercises and designation came to be their first and only ordinances » (Juan Perez de Guzman, La Casa del Rey Moro, Madrid 1920). The emergence of noble bodies in certain cities and the gradual acceptance of the term Maestranza to describe them towards the last third of the seventeenth century led to the renaming of the former Brotherhood of the Holy Spirit. While their means and objectives remained unchanged, their internal organisation underwent restructuring to adapt to the times. A historical meeting was held on 17 October 1706 on the grounds of the Church of Our Lady of Grace during which the Maestranza became a separate entity to the City Hall, taking on new members. Their participation in the War of Succession (1701-1730) culminated in the granting of privileges to the Maestranzas by Philip V in 1730 which was ratified by Ferdinand VI. The Ronda Maestranza was renamed the Royal Maestranza of Cavalry, which it is still known as today. 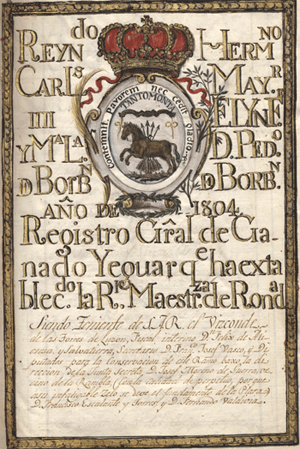 Throughout the eighteenth century, the kings honoured these institutions with a number of privileges, among them the mandate granted by Philip V according to which the Grand Brother (Hermano Mayor) must always be a member of the royal family, a post which would later be held by the King himself. This period is considered to be the guild's golden era. The Maestranza saw its membership increase, set up a stud for breeding horses (an initiative that would end in the War of Independence), undertook the drafting of laws and created a Youth Academy of Sciences for the children of its members. It was at this time that the bullring was constructed and that bullfighting reached its peak. The jousting and tournament stage was moved from the Carrera del Pozo to the Santa María la Mayor. "The two most important bullfighting dynasties of all times - the Romeros and the Ordóñez - were born in Ronda"
Despite the advent of state-financed and state-controlled armies in the countries of the new Europe, the military body of the Royal Maestranza of Ronda did not completely abandon its preparations for war as was demonstrated when it joined up with the forces to combat the invasion of Napoleon Bonaparte. Following Charles IV's abdication and the accession to the throne of his son Ferdinand VII, the four maestranzas were summonsed to exhibit their skills for the planned meeting of the King with Napoleon I. The popular uprising against French troops on 2 May prevented the demonstration and gave rise to the Battalion of the Maestranza, which participated in the battle of Almonacid. Its army having made its contribution to history, the Maestranza of Ronda continued to maintain its riding school and shifted the focus of its activities toward culture and charity. Over the centuries that followed, the members of Ronda's maestranza continued the tradition of bull-spearing and «if the code of honour required, of walking right up to stare them in the eye and bring the bull to its knees with a slash of the sword ». This hundred-year-old game involving the bull was the origin of noble and popular bullfighting, later giving way to modern-day bullfighting on foot. The extraordinary fact that the two most important bullfighting dynasties of all times - the Romeros and the Ordóñez - were born in Ronda, can only be attributed to the existence of an institution such as the Royal Maestranza de Caballería of Ronda.